When you're tired of city life — or just tired of life on the ground — there's nothing more wonderful than scampering up a tree to your bedroom. A few lucky people among us actually get to do it. 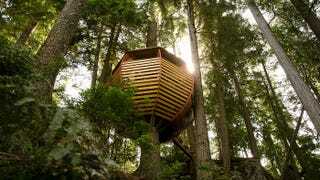 Here are the places they go: the most beautiful and bizarre tree houses in the world. It's accessible by both a spiral stairway and an elevator built inside the trunk. From the front door one could ski down to the ski lift, take the lift and ski back down to the house. A central shaft that runs vertically through the house supports the house. In the interior the central shaft is a fireplace for each of the house's three floors. The house is designed with two garages on each of the entry floors. One enters the house on a split-level. A half level up has two master bedroom suites separated by the central shaft with a fireplace and whirlpool in it. A half level down from the entry is the community family areas, living, kitchen, etc. The lowest level is the children's playroom/ dormitory. – as it stands on the architect's homepage. Too-High Teahouse, built by a Japanese professor of architecture named Terunobu Fujimori, completed in 2004 in Takasugi-an, Japan, in his father's garden. The Minister's Treehouse in Crossville, Tennessee, built by Minister Horace Burgess for fourteen years from only $12,000. The building is 97 ft (29.5 m) tall, has five stories, a church and a bell tower. The bells are repurposed oxygen acetylene bottles.